I read a post over at Tarotize.com called, "The Magick of Your Name Tarot Spread," and I haven't done the whole spread, but I did use the formula to calculate the card that corresponds to my life purpose. The number turned out to be 9 - The Hermit. This card resonates deeply with me. The Myers-Briggs Type Indicator places me in the INFJ personality category. INFJ's and The Hermit share many of the same qualities. We're private, introverted, spiritual and intuitive. 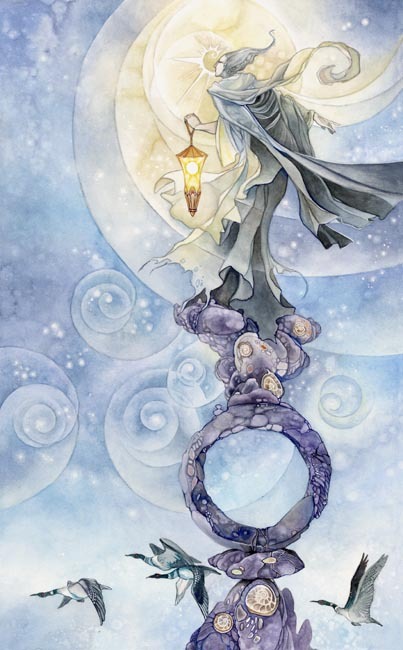 "The Hermit Tarot card suggests that you are in a phase of introspection where you are drawing your attention and focus inward and looking for answers within. You have a strong need to understand, not just at the surface level but to really know why life is the way it is. The Hermit reflects that your consciousness has moved inward and you now realise that the truth and understanding you seek is within yourself and not in the distractions of the outside world. This is a perfect time to take a step back from your day-to-day life and deeply contemplate your motivations, personal principles and values." This describes, not a "phase" for me, but my everyday life as it has always been. So,...perfectly. But the coolness doesn't stop there. Siddaleah is not my given name. It is an online persona that I've used for years. I chose it because I liked it and loved the book the name came from. (Divine Secrets of the Ya Ya Sisterhood) I modified the spelling a bit in a way that is meaningful to me and to make the name my own. I calculated my life's purpose using my given name, but just for fun I calculated it for my online persona, Siddaleah too. I wondered if the real me and the online me were much different from each other. Siddaleah works out to correspond with The Hermit too. How cool is that? !